Texas has some of the worst civil forfeiture laws in the nation, as demonstrated by an Institute for Justice report, Policing for Profit: The Abuse of Civil Asset Forfeiture. Texas law establishes a trifecta of circumstances that invite forfeiture abuse. First, Texas allows law enforcement agencies to police for profit—to seize and sell property then return the proceeds directly into their budgets giving them a financial incentive to abuse this power. Second, Texas uses a “preponderance of the evidence” standard for determining whether a particular seizure is valid, rather than the “beyond a reasonable doubt” standard for criminal defendants. Third, Texas places the burden on the innocent owner to prove his innocence. Small businessman Zaher El-Ali, who goes by Ali, has lived in Houston for more than 30 years, and is in many ways a classic American immigrant success story. Ali struggled to get his Chevrolet Silverado pickup truck back from Harris County police and prosecutors for the better part of nine months. The pickup was seized by the police after they stopped the truck’s driver for driving while intoxicated. But the driver did not own the Silverado. The driver was making payments to purchase the truck from Ali, but had not finished paying for it. Ali retained title, and would like to get his truck back. But under Texas law, the burden is on the property owner, and, as Ali found out, it is very difficult to get your property back once it has been seized for civil forfeiture. That is why he brought a counterclaim in the case of State of Texas v. One 2004 Chevrolet Silverado to challenge Texas’ civil forfeiture statute as a violation of his constitutional rights. For the benefit of all Texans, Ali challenged the profit incentive that underlies civil forfeiture in the state. He also challenged the provision of the law that places the burden on owners to prove their innocence, rather than on the state to prove their guilt. The goal of Ali’s challenge was to help rebalance Texas law enforcement priorities, take the profit out of civil forfeiture, and protect innocent property owners caught up in an upside-down legal process that violates fundamental constitutional standards of due process. Under civil forfeiture, law enforcement agencies may confiscate property such as homes, cars and cash that they merely suspect may be connected to a crime. Civil forfeiture differs greatly from criminal forfeiture. With criminal forfeiture, it is the owner who is on trial, and the property can only be forfeited if the owner has first been convicted of a crime. But with civil forfeiture, the government proceeds against the property directly under the legal fiction that the property somehow acted to assist in the commission of a crime. That is why civil forfeiture proceedings have bizarre titles, such as United States v. $10,500 in U.S. Currency or People v. Certain Real and Personal Property or, in this case, State of Texas v. One 2004 Chevrolet Silverado. And because they are civil actions, most constitutional protections afforded criminal defendants do not apply to property owners challenging civil forfeiture. Moreover, it is not necessary for the government to demonstrate that a property owner is guilty of criminal misconduct. Indeed, forfeiture can occur even when criminal charges have never been filed against a property owner. But perhaps the most troubling aspect of modern civil forfeiture laws is the profit incentive at their core. The overriding goal for law enforcement officials—both prosecutors and police—should be the fair and impartial administration of justice. Civil forfeiture laws at the federal level and in more than 40 states, though, dangerously transform law enforcement priorities away from this goal and instead toward the pursuit of property. Texas is one of those states that permit police and prosecutors to keep 90 percent of forfeiture proceeds for their own use. This paying of law enforcement personnel on commission has, not surprisingly, led to a shocking record of abuse. The Institute for Justice is now involved in a case, State of Texas v. One 2004 Chevrolet Silverado, that represents an all-too-typical example of forfeiture abuse. This case, the inaugural effort by the Institute to stop forfeiture abuse on a national level, presents an opportunity to both strengthen protections for innocent property owners caught up in forfeiture proceedings and to end the direct financial incentives at the heart of these laws. Importantly, if the Institute for Justice is successful in its efforts, law enforcement will still be able to convict criminals and seize their ill-gotten gain while at the same time respecting the constitutionally enshrined rights of property owners who have done nothing wrong. In 2005, the Montgomery County district attorney’s office held a party that included beer, liquor and a margarita machine paid for with forfeiture funds. In 2005, a man driving from Austin to Brownsville to visit his dying aunt was pulled over because his borrowed Mazda’s front license plate was sitting on the dash instead of mounted on the bumper. Police found $10,000 he was traveling with to make funeral arrangements for his aunt. They immediately took him to the local fire station for interrogation and to conduct a more thorough search of the car. Despite the fact that no drugs or contraband were found, the man had to hire an attorney to get his money back—finally—three years later in 2008. In 2008, a west Texas district attorney used forfeiture funds to pay for his entire staff to travel to Hawaii for training. A district judge in that county was recently indicted for illegal use of $34,000 of the forfeiture funds. In 2009, the small east Texas town of Tehana was sued by African-American plaintiffs, who claimed that the town had seized more than $50,000 based on money laundering charges, although no criminal case was ever filed. One couple claimed they were forced to forfeit more than $6,000 after police and prosecutors made threats to put their children in foster homes. The Chevy Silverado case seeks not just to remedy a specific instance of forfeiture abuse. Rather, it goes to the heart of what drives these abuses in the first place: the lack of protections for innocent owners and the perverse profit incentive at their core. Zaher El-Ali (who goes by “Ali”) has lived in Houston since the 1970s. He moved to the United States from Jordan while he was in his 20s and is a classic American immigrant success story. He arrived in Houston on a Greyhound bus in 1978 with $500 in his pocket, knowing no one. He met a man on the bus and the man told Ali that he could stay with his family until he got on his feet. He worked with the couple in their family business cleaning office buildings. He graduated with a degree in business from the University of Houston in 1984 and spent about 10 years in the insurance business. He became an American citizen in 1987. He started a family and had three sons. Two of his children are in school while the oldest is a medic in the U.S. Army. Ali yearned to pursue the American Dream by starting his own business. So he got out of insurance and became primarily a real estate investor. He has managed to make a comfortable although not wealthy life for himself and his family. He buys homes and cars, fixes them up, and then sells them. He lives and has his business in East Houston and largely serves a lower-income population. Ali has no arrests or criminal history. In 2004, Ali sold a 2004 Chevrolet Silverado truck to a man who paid him $500 down and agreed to pay the rest on credit. As with all cars bought on credit, Ali held the title to the car until he was paid in full and also registered the car in his name. In July 2009, the buyer was driving the Silverado and was pursued by a police officer on suspicion of drunk driving. When stopped by the police, he was arrested for DWI. Because the driver attempted to evade the police and this was his third DWI arrest, he was imprisoned, pled guilty and was sentenced to six years in prison. After the man’s arrest, the Silverado was seized for civil forfeiture. It has been sitting in the Harris County impound lot ever since. Later, in July and September 2009, Ali wrote to the district attorney, telling him of his interest in the truck and attaching copies of the title and registration naming Ali as the owner and asking for its return. The driver has been in jail since July 2009 and had stopped making payments. The government responded by filing a civil forfeiture action against the truck: State of Texas v. One 2004 Chevrolet Silverado. Through the filing of counterclaims in the case, Ali wants not only to get his truck back but also to stop the state from abusing forfeiture law against all Texas citizens. Although the U.S. Supreme Court expanded forfeiture law during the exigencies of the Civil War, throughout most of the 20th century, civil forfeiture remained a relative backwater in American law, with one exception—the government used it extensively during Prohibition against automobiles and other vehicles transporting illegal liquor. Modern civil forfeiture expanded greatly during the early 1980s as governments at all levels stepped up the war on drugs. No longer tied to the practical necessities of enforcing maritime law, the forfeiture power has become one of the most powerful weapons in the government’s crime-fighting arsenal. For instance, in 1986, the second year after the creation of the U.S. Department of Justice’s Asset Forfeiture Fund, the fund took in $93.7 million in proceeds from forfeited assets. In 2008, for the first time in the fund’s history, the fund topped $1 billion in forfeited assets. Changes in the law have had a profound effect on law enforcement priorities. Indeed, in 2008, it was reported that the Bureau of Alcohol, Tobacco, and Firearms had ordered Leatherman multi-tools inscribed with the words “ATF – Asset Forfeiture” and “Always Think Forfeiture.” Researchers point to evidence indicating that the use of state forfeiture is, likewise, extensive and growing. Three factors work in combination to set up modern forfeiture abuse. Most states, including Texas, and the federal government allow law enforcement agencies to keep 90 percent or more of the profits from assets they forfeit. This money may be used for better equipment, nicer offices, newer vehicles, trips to law enforcement conventions and—in states like Texas—even police salaries. Thus, law enforcement agencies benefit in a very direct way from every dollar in assets and currency they manage to seize and forfeit. This profit motive forms the rotten core of forfeiture abuse. The second way states make civil forfeiture harder on property owners is to establish a lower “standard of proof” under which the government can take the property. As most people know, the standard of proof in a criminal proceeding is “beyond a reasonable doubt.” That is, the state must demonstrate to the jury that evidence shows that the accused individual committed the crime beyond a reasonable doubt. This high standard exists to protect the rights of innocent individuals who might be accused of a crime. But innocent property owners enjoy no such protections. In only two states (Nebraska and Wisconsin) does the civil forfeiture standard match the criminal standard—“beyond a reasonable doubt.” And North Carolina has nearly abolished forfeiture entirely. Most states, including Texas, however, have adopted a “preponderance of the evidence” standard, a standard that is usually reserved for such things as contract disputes. Texas uses this modest standard to take away property from its citizens. Finally, many states—including Texas—shift the burden of proof from the state to the owner to prove that he or she is innocent of the crime in forfeiture cases. In other words, with civil forfeiture, property owners are effectively guilty until proven innocent. The increased burden (including substantial legal costs) with proving one’s innocence can result in owners abandoning rightful claims to seized property. And if owners do not fight civil forfeiture and the government wins by default, law enforcement agencies are more likely to engage in it. The net effect of these three factors is to increase the use of forfeiture by law enforcement agencies by incentivizing forfeiture through making it profitable for the agencies that engage in it, by making it easier to keep seized property (by lowering the standard of proof) and by making it more expensive and difficult for owners to challenge the action (by shifting the burden of proof to the innocent owner). 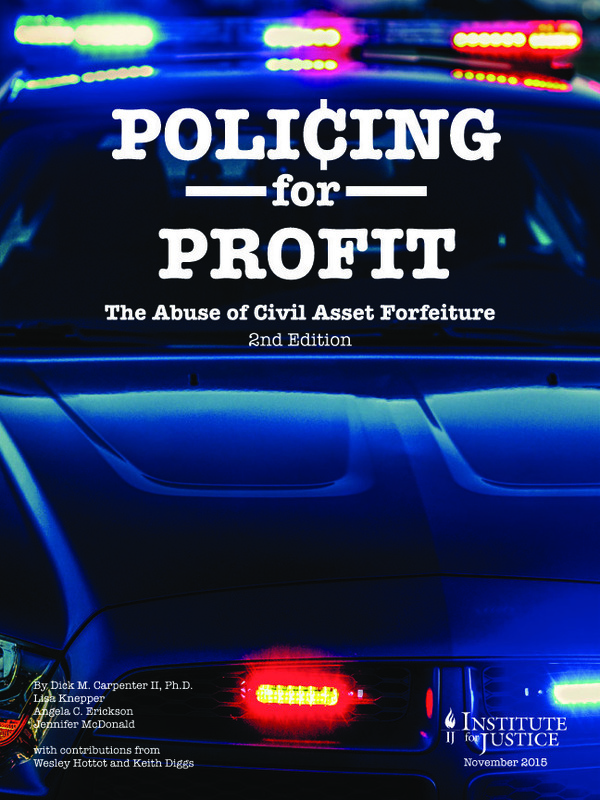 A March 2010 report from the Institute for Justice, Policing for Profit: The Abuse of Civil Asset Forfeiture,  shows just how widespread police profit from civil forfeiture has become. The report, which grades all 50 states and the federal government based on how well their asset forfeiture laws protect private property rights, gives Texas a “D-” because the Texas statute does almost nothing to protect innocent owners. The report demonstrates that forfeiture in Texas has skyrocketed from $18,983,274 in total assets seized in 2001 to $49,179,252 in 2008. Over the seven-year period studied by the report, Texas law enforcement agencies seized $225,592,873—nearly a quarter billion dollars—in currency and property under civil forfeiture. Data show that Texas law enforcement agencies rely heavily on forfeiture funds. In a random sample of 52 Texas law enforcement agencies, plus the top 10 forfeiture-earning agencies, forfeiture revenue amounts, on average, to 14 percent of agency budgets. For just the top 10 forfeiture money-makers, forfeiture dollars equal about 37 percent of agency budgets. Even though drug use in America has remained relatively stable since the early 1980s, drug arrests and the use of asset forfeiture have increased considerably. Contrary to the claims of forfeiture advocates, data suggest that forfeiture is not typically used to pursue high-level targets and major criminal organizations. For instance, in Virginia, one-half of all currency forfeitures between 2001 and 2006 involved amounts less than $1,288. When state laws make forfeiture harder and less profitable, law enforcement engages in more of what is known as “equitable sharing”—that is, the process by which state and local law enforcement agencies turn over forfeiture cases to the federal government, which then returns as much as 90 percent of the value of what is forfeited back to state and local law enforcement agencies. Equitable sharing is an easy way for law enforcement agencies to circumvent state-imposed safeguards against the abuse of forfeiture. Moreover, the researchers found that the profit motive and the innocent owner burden—two large problems with Texas law—are significant factors in determining how much equitable sharing an agency receives. An average-sized agency in a state with a 100-percent profit motive will take in $30,000 more in equitable sharing than an agency in a state with no profit motive. The difference for agencies in states where owners are presumed innocent versus those where owners are presumed guilty is $27,600. Drug sniffing dogs are notoriously unreliable when it comes to cold hard cash. Famously, in 1985, the Miami Herald asked 11 prominent citizens to supply a $20 bill for drug trace analysis. Ten of the 11 bills tested positive for drugs, including ones provided by Janet Reno, Jeb Bush and a former Miss America. A 1987 study by the Drug Enforcement Agency found that one-third of all money at the Federal Reserve Building in Chicago had traces of cocaine and recommended “that trace analysis of currency for general enforcement or seizure be stopped.” Despite their unreliability in the currency context, law enforcement agencies routinely use drug sniffing dogs to “prove” that currency was involved in illegal drug activity. Six states earned an F, and 29 states received a D for their laws alone. Lax federal laws earn the federal government a law grade of D-. Eight states receive a B or higher for their laws: Indiana, Maine, Maryland, Missouri, North Carolina, North Dakota, Ohio and Vermont. But extensive use of equitable sharing pulls down the final grades of five of those states: Indiana (C+), Maryland (C+), Missouri (C+), North Carolina (C+) and Ohio (C-). The lowest-graded states overall, combining both poor laws and aggressive use of equitable sharing, are Georgia, Michigan, Texas, Virginia and West Virginia. Each received overall grades of D-. One key feature of the Act is its shifting of the burden of proof in forfeiture cases. In a criminal case, the government must prove its case against the accused. If it cannot, the accused goes free. The burden of proof is on the government. In Texas, the burden to prove that seized assets were not related to criminal acts rests on the person whose assets were seized. And the government only needs to meet a “preponderance of the evidence” standard to hold on to seized assets. The bar for seizing assets is low, and the bar for getting them back is high. Thus, the government can seize assets, never charge the individual with any crime and then demand that the individual prove that the assets were not connected to criminal activity. This process is so expensive and complicated—essentially proving a negative—that most individuals cannot afford to fight to get their assets back. Law enforcement agencies in Texas can enter into agreements that permit them to keep for their own use all of the property or currency they forfeit. Moreover, unlike many states, Texas law enforcement can even use revenue generated from forfeiture to pay salaries. And preliminary research in Texas has found that law enforcement agencies rely on forfeiture to a significant extent for their overall budgets. When public officials and their agencies have a direct financial stake in the outcome of their actions, courts have subjected such actions to closer scrutiny. Impartiality is one of the primary principles guaranteed by the Due Process Clause of the U.S. Constitution. The clause guarantees the right to an impartial tribunal in criminal and civil cases. In such cases as Tumey v. Ohio, the Supreme Court held that an impermissible bias exists when the fact finder has a financial interest in the outcome. The Supreme Court has also held that the Due Process Clause could be violated even if an official does not receive a direct benefit from a particular scheme, so long as his department or agency could. Moreover, the relevant inquiry is whether the scheme creates a possible temptation (rather than a proven biased result). The strict impartiality standard set forth in Tumey and a follow-up case, Ward v. Village of Monroeville, primarily concerned the conflict of interest that arises when a judge or other adjudicatory official has a direct monetary stake in the outcome of the proceeding. In Marshall v. Jerrico the U.S. Supreme Court addressed the question of whether some law enforcement incentives create an unconstitutional conflict of interest for officials beyond judges. We do not suggest . . . that the Due Process Clause imposes no limits on the partisanship of administrative prosecutors . . . . [T]he decision to enforce—or not to enforce—may itself result in significant burdens on a defendant or a statutory beneficiary, even if he is ultimately vindicated in an adjudication. A scheme injecting a personal interest, financial or otherwise, into the enforcement process may bring irrelevant or impermissible factors into the prosecutorial decision and in some contexts raise serious constitutional questions. The Court upheld the labor department program because the program was too small to play a role in decisions about whom to prosecute and how much to fine someone. Looking at a three-year period, the Court noted that the prosecuting body, the Employment Standards Administration (ESA), was not financially affected by the rather small amount of penalties collected. Moreover, the national office of the ESA allocated the penalties among the regional offices and departments, so one particular office could not directly benefit from any specific penalties it prosecuted. Moreover, the amounts handed down by the national office were based upon the expenses incurred by the regional office, not by the amount of penalties the office collected. Therefore, according the Court, any hint of bias was “too remote and insubstantial” to violate the due process clause. In contrast, the three factors set forth in Jerrico in civil forfeiture cut exactly the opposite way with regard to civil forfeiture. In Texas, law enforcement agencies can and do fund their activities through forfeiture revenue. Moreover, law enforcement agencies can receive direct benefits from forfeiture through increased budgets, overtime pay, use of seized assets such as automobiles, etc. In Texas, salaries can even be paid through forfeiture revenue. Last, the more seizures and forfeitures the agency undertakes, the higher the reward for each participating agency. Law enforcement officials are not reimbursed simply for the expenses of bringing of a forfeiture action. The agencies are instead reimbursed directly on the basis of how much property was seized and forfeited. The more forfeiture actions brought, the more the agencies can benefit without limitation. Ali’s challenge in the Chevy Silverado case seeks to end policing and prosecuting for profit. Ali asks the court to strike down Texas’ perverse incentive scheme as a violation of the due process guarantees of the U.S. and Texas Constitutions. Forfeiture revenue should be placed in the general fund of the state or at least a neutral fund, like drug treatment. Those who are enforcing the law should not stand to financially benefit from the confiscation of private property. Ali’s case involves two additional claims, both regarding the innocent owner defense. First, Ali brings a claim that he is an innocent owner of the Silverado. When Ali sold it to the now-incarcerated man in 2004, he could not have known that the man would drive the truck while intoxicated in 2009. Much like GMAC or Honda American Credit, Ali did nothing more than finance the vehicle in an arm’s-length transaction. The driver has stopped making payments on the truck, giving Ali the right to repossess it. Ali is an innocent owner of the vehicle in every sense of the word. The second challenge under the innocent owner law involves the mechanism by which the law shifts the burden of proof from the government and onto the owner who is trying to reclaim their property. Texas requires an innocent owner to “prove by a preponderance of the evidence that” the owner did not know that the property would be used in the commission of a crime. This is the reverse of a typical criminal trial, where the government must prove that the crime occurred. The innocent owner is being asked, in effect, to prove a negative. And keep in mind, Ali, the owner of the vehicle, was no more responsible for the ill-use of the truck that he owned than GMAC or any other major car leasing company would be when a driver of their vehicles breaks the law. Moreover, the current standard in Texas for an innocent owner defense is not only whether the property owner knew but whether he “should have known” that the property would be used illegally. If a court finds that the answer is “yes” to either question, the property can be forfeited even without actual knowledge of the owner. In February of this year, the state served some outrageous discovery requests on Ali, asking him, for instance, whether he inquired about the buyer’s previous DWI arrests before he sold him the car, apparently now imposing a new burden on sellers to investigate the backgrounds of potential buyers even in regular business transactions. Moreover, the discovery demanded completely irrelevant documents such as all of Ali’s canceled checks and personal and business tax records for the past two years. The discovery seems clearly designed to intimidate owners from fighting back against civil forfeiture and to just throw in the towel and permit the government to win by default. In addition to getting Ali’s truck back, the case will also seek to strengthen the innocent owner defense under Texas law by arguing that a property owner must have actual knowledge or at least be grossly negligent in loaning or selling property to someone before they can be held responsible for the transgressions of the purchasers or users of property. The lead attorney in this case is Institute for Justice Senior Attorney Scott Bullock, who has litigated a number of property rights challenges, especially in the realm of eminent domain abuse. Bullock is best known for arguing the Kelo eminent domain case before the U.S. Supreme Court on behalf of the homeowners. He is joined in the litigation by Matt Miller, executive director of the Austin-based Institute for Justice Texas Chapter (IJ-TX), and Wesley Hottot, an IJ-TX staff attorney. Utahans for Property Protection—IJ represented a group of Utah citizens who filed a “notice of claim” with the attorney general of Utah, successfully forcing him to take immediate action to secure the return of the funds frm forfeitures that should have gone to public education. Wells v. City of Riviera Beach—In May 2007, the Institute for Justice defeated an attempt by the city of Riviera Beach, Fla., to displace more than 5,000 residents with the use of eminent domain for a massive private development project that included a yacht marina, luxury condominiums and upscale hotels. City of Norwood v. Horney—In a resounding repudiation of the U.S. Supreme Court’s decision in Kelo v. City of New London, the Ohio Supreme Court unanimously ruled in July 2006 that the city of Norwood acted unconstitutionally by taking the homes of the Institute for Justice’s clients for a private development project. Kelo v. City of New London—Just three years after this landmark U.S. Supreme Court ruling, which allowed private property to be taken for the mere promise of possible economic development, 43 states have tightened their restrictions on eminent domain thereby better protecting property owners. Casino Reinvestment Development Authority v. Banin—In a classic David versus Goliath battle, the Institute for Justice scored a major victory for property rights in July 1998 when the New Jersey Superior Court ruled a state agency could not condemn widow Vera Coking’s home of 37 years and give it to Donald Trump for his private development. The Institute for Justice is a public interest law firm that advances a rule of law under which individuals can control their destinies as free and responsible members of society. Through litigation, communication, activism, strategic research and legislative counseling, IJ secures protection for individual liberty and extends the benefits of freedom to those whose full enjoyment is denied by the government. The Institute for Justice is based in Arlington, Virginia. In addition to Texas, IJ has state chapters in Arizona, Washington and Minnesota, as well as a Clinic on Entrepreneurship at the University of Chicago Law School. See, e.g., Tex. Code Crim. Proc. Ann. art. 59.02 (Vernon 2010). The Sheriff’s Stash, The Economist, July 10, 2008. Jan Reid, Highway robbery, The Texas Observer, 10(10), 16, May 16, 2008. Judith Pannebaker, Indictments continue in 198th Judicial District, Bandera County Courier, February 25, 2010, http://www.bccourier.com/Archives/News_detail.php?recordID=100225N7. Marian R. Williams et al., Policing for Profit: The Abuse of Civil Asset Forfeiture (Institute for Justice 2010). Available at: http://www.IJ.org/PolicingForProfit. Lawsuit: Texas town stops minorities, seizes property, CNN, March 11, 2009, http://edition.cnn.com/2009/CRIME/03/11/texas.car.stops.lawsuit/index.html. Texas Senate Committee on Criminal Justice, Interim Report to the 81st Legislature, December 2008, 65-66. State of Texas v. One Chevrolet Silverado, No. 2009-52869 269th Judicial District, Harris County, Tex. Aug. 19, 2009. Michael Schechter, Fear and Loathing and the Forfeiture Laws, 75 Cornell L. Rev. 1151, 1154 (1990); James Maxeiner, Bane of American Forfeiture Law—Banished at Last?, 62 Cornell L. Rev. 768, 772 (1977). James Maxeiner, Bane of American Forfeiture Law—Banished at Last?, 62 Cornell L. Rev. 768, 772 (1977). See, e.g., The Palmyra, 25 U.S. (12 Wheat.) 1 (1827). See United States v. Brig Malek Adhel, 43 U.S. (2 How.) 210, 233 (1844). See United States v. Brig Malek Adhel, 43 U.S. (2 How.) 210, 233 (1844) (emphasis added). Mark Frauenfelder, ATF Leatherman tool kits inscribed: “Always Think Forfeiture,” BoingBoing, June 9, 2008, http://boingboing.net/2008/06/09/atf-leatherman-tool.html. See, e.g., Tex. Code Crim. Proc. Ann. art. 59.06(c)(2) (Vernon 2010). See, e.g., Neb. Rev. Stat. § 28-431(4) (2009); Wis. Stat. § 961.555. N.C. Gen. Stat. Ann. §75D-5 (2009) (forfeiture only for racketeering). Tex. Code Crim. Proc. Ann. art. 59.05(b) (Vernon 2010). Tex. Code Crim. Proc. Ann. art. 59.02(c) (Vernon 2010). Even in those states that do not allow law enforcement agencies to keep forfeiture funds, the federal practice of equitable sharing can be used as an end-run around this important safeguard. Under equitable sharing, the local law enforcement agency turns seized assets over to the federal agencies—making it subject to federal law and circumventing state safeguards. The federal agency then turns some portion of the proceeds back to the state agency. For instance, from 2000 to 2008, the federal government returned over $200 million to Texas law enforcement agencies through equitable sharing arrangements. This kickback arrangement can render ineffective even the most conscientious state reforms. For sources of all data in Policing for Profit, please see the end notes contained in the report. H.B. 65, 71st Tex. Leg. 1st Special Session (1989). Tex. Code Crim. Proc. Ann. art. 49.01(2) (Vernon 2010). Tex. Code Crim. Proc. Ann. art. 59.01(2) (Vernon 2010). Tex. Code Crim. Proc. Ann. art. 59.06(c)(2) (Vernon 2010). Tex. Code Crim. Proc. Ann. art. 59.05(d) (Vernon 2010). Tex. Code Crim. Proc. Ann. art. 59.06 et seq (Vernon 2010). Tumey v. Ohio, 273 U.S. 510, 532 (1927) (a conflict of interest exists where a scheme would “offer a possible temptation to the average man as a judge…not to hold the balance nice, clear and true”). Ward v. Village of Monroeville, 409 U.S. 57 (1972). Marshall v. Jerrico, 446 U.S. 238 (1980). Marshall v. Jerrico, 446 U.S. 238, 249-50 (1980). Tex. Code Crim. Proc. Ann. art. 59.02(c) et seq (Vernon 2010).